Discrete Wavelength Ellipsometer & Spectroscopic Ellipsometer - Home Page - Angstrom Advanced Inc.
Angstrom Advanced offers full range of ellipsometers for thin film thickness measurements, optical characterization for refractive index and extinction coefficient analysis (n & k). You can find Angstrom Advanced Ellipsometers in some of the most prestigious laboratories such as MIT, NASA, UC Berkeley, Yale University, Duke University, NIST and many more. Angstrom Advance's mission is to manufacture, supply and support the most accurate and stable ellipsometers on the market. Angstrom Advanced sets the standard in Ellipsometry. Many upgradable accessories are available for different applications. The PHE-103 Ellipsometer is a new model which adds the Transmission and Variable Angle Reflection function. This variable angle spectroscopic ellipsometer operates in the spectral range 250 - 1100nm or 250-1700nm or 250-2100nm, a broad band white light source to illuminate the sample spot. NS-IRSE infrared spectroscopic ellipsometer is a unique infrared spectroscopic ellipsometer instrument based on monochromator-dispersion. It features highest accuracy, precision and is more economical compared to FT-IR spectrometer. 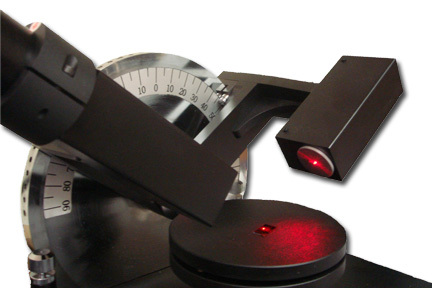 Angstrom Advanced Inc offers a full line of Ellipsometer accessories including: Ellipsometry Wafer Mapping & Motorized X-Y Sample Stage,Automated Angle of Incidence, Micro Spot, Liquid Cell, Heater, CCD Image Camera and many others. Angstrom Advanced Inc. All Rights Reserved.